AS some rushed around in the frolic of fun and others in the frantic of safety during the flash floods that hit a fortnight ago, there was a silent fight for survival in the muddy, murky waters of Nadi. Under the brown rush that tore through the banks of the Nadi River flooding the jet-set town and nearby suburbs and sending thousands for the safety of high and dry ground ù came the little sharks. They, like some of those unfortunate to have been caught and swept away at the height of the flood in Nadi after a torrent of 292mm of rainwater (24 hours from 9am January 24th to 9am January 25th), desperately fought the raging flood currents that have slowly eroded the riverbanks over the years. So when one fought its way through the force of nature to the calmer floodwaters in the suburbs, and was found dead when it couldn’t get food in its new concrete and grassy environment, there was a lot of excitement and pain. Someone recalled New Orleans in 2005 when Hurricane Katrina lashed the United States coast, flooding the city and bringing out alligators from the swamplands of Louisiana into the flooded streets. While those alligators fed on the dead left behind at the mercy of Katrina’s waters and lived to be captured for their return to the wild in New Orleans’ recovery, our little predators ù destined to become kings of the reefs and a big money earner if kept alive ù struggled for life. That young reef blacktip shark that never found its way back to where it came from in the cover of mangroves had little chance in Nadi’s suburbs. Helen Sykes, a marine ecologist with CORAL (Coral Reef Alliance, Fiji)) who has studied sharks around Fiji including the Nadi Bay area, Yasawa and the Mamanuca Group, believes the shark was swept away from its nursery feeding grounds when the river broke its banks. “This very small shark was only a few weeks old and would normally have spent the first year of its life catching shrimps, octopus and very small fish in the mangroves of mud flats of the Nadi River,” she says. 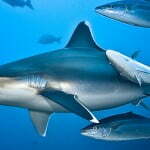 These sharks are attracted by the bright lights of the resorts and are great tourist attractions. The efforts to save the sharks around the country’s tourism hot zone have stepped up in recent years with conservation campaigns in nearby island resorts to Nadi. CORAL, in conjunction with the Pew Environment Group, has been doing the ground work, researching the shark species under threat from overfishing and raising awareness on their importance to our reef systems. Without sharks, the top predator in the marine food chain, the reef life system is disrupted and reefs eventually die a slow death. When the reefs on which we depend so heavily on for our life in the islands die, we suffer. 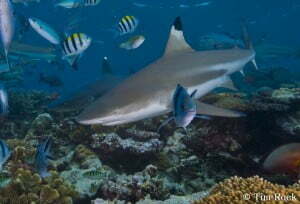 Sadly, Fijians are fishing sharks indiscriminately for quick money. The sharks are among the most valuable, their fins fetching up to $F150 a kilo in Fiji, this transferred to $US100 ($F175) for a small bowl of shark fin soup in some Hong Kong restaurants. Conservationists are working with the Ministry of Fisheries to bring about legislation to stop the fishing of sharks and make Fiji’s waters a shark sanctuary. Sharkman Manoa Rasigatale, who is spearheading conservation awareness around the islands, says every shark counts ù even a lost baby blacktip in Nadi’s floods. “They are no threat to human beings,” he says. “They are fearful of humans and, if people find baby sharks in their flooded yards, try and keep them alive and call the proper authorities. If not, return them to their natural habitat if you can. 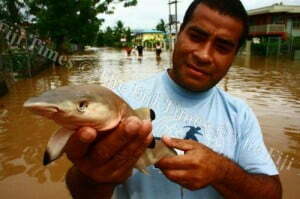 Ms Sykes says many baby sharks are caught in the nets of fishermen in Nadi Bay, or eaten by a bigger grouper or shark. 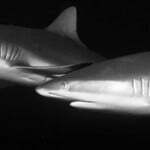 “Reef blacktip sharks are no threat … although if you are wading through shallow waters, the babies have been known to nip at toes. “Those that make it to adulthood move out to shallow coral reefs where they grow to not much more than one-and-a-half metres long. With more flooding predicted in the west in the coming days as Cyclone Jasmine hovers at a threatening distance, the baby sharks are equally at risk as the humans that fish them in the Nadi Bay. The efforts to save them have been visible with their growing and sustainable numbers in and around the Yasawa and Mamanuca islands and Nadi’s coast. Taking that extra step to stop those fishermen and helping the little ones caught in the flood will go a long way in their conservation. For Bibleman Ahmaad Safi, who sells the holy book in Suva’s streets at a price he reckons “is a blessing”, the discovery of the young reef blacktip in the floodwaters “in town” is a divine sign. “This is going to be a blessed river, the first time we’ve seen a shark pour over into the street from it. For the wrong reason it may be but it’s a sign of good things to come for Nadi if its sharks are plentiful and survive overfishing,” says the Bibleman. 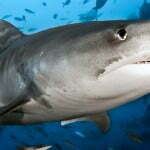 “Fiji will be a blessed nation if we save the sharks. Greed for the money it brings can kill them off. Kept alive, they will mean a lot more and earn us more than they are dead. We must not deny ourselves this God-given blessing. They can be told from other sharks by their sharp nose, and black tips on the dorsal fin (back fin), pectoral fins (side fins) tail and smaller fins. 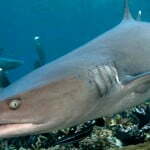 They are a small shark, they do not get much larger than a metre and a half long.